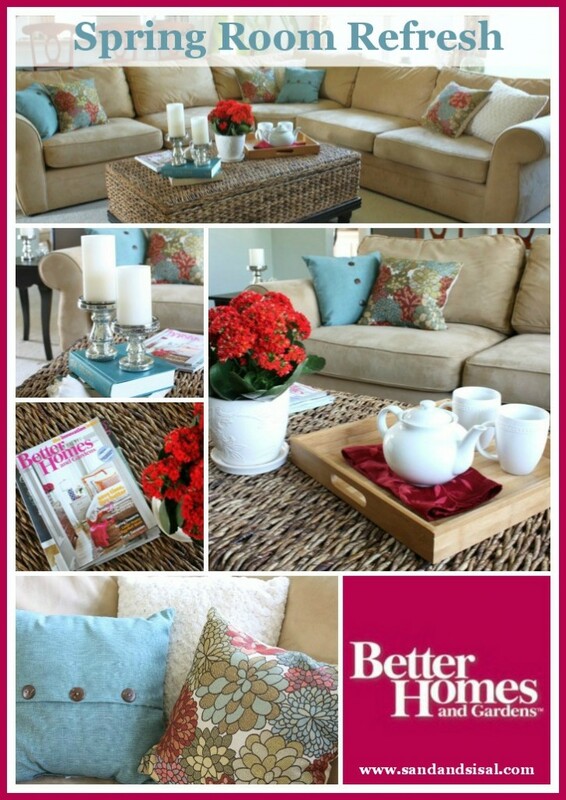 Better Homes & Gardens at Walmart gave me an amazing opportunity to give my family room a “Spring Room Refresh” using the new and affordable BHG line of products at Walmart. 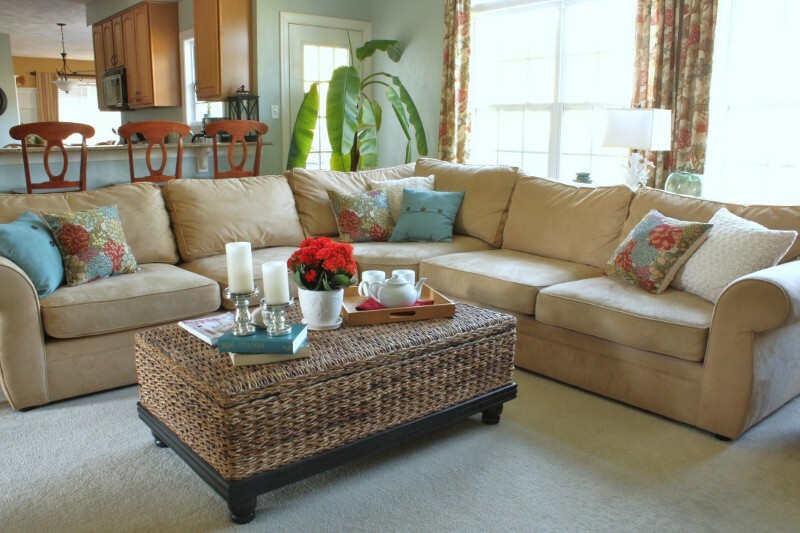 Come and see how you can give your family room a fresh new look without breaking the bank! I wish I could show you how the room looked before I repainted the walls and added new drapes, but I want to be real about my “before pic”. To be honest, my before is not too shabby in my opinion. …. but let’s turn it up a notch! Let’s make it a bit more “spicy” as my daughter now describes the room. How about adding a deeper punch of sea salt blue pillows and brighter pops of red and sage with an embroidered texture? Isn’t it all coming together nicely?! We are FINALLY & SUCCESSFULLY blending my past red and gold decor with the fresh and updated sea salt gray and sand colored decor. Every room needs a bit of sparkle. 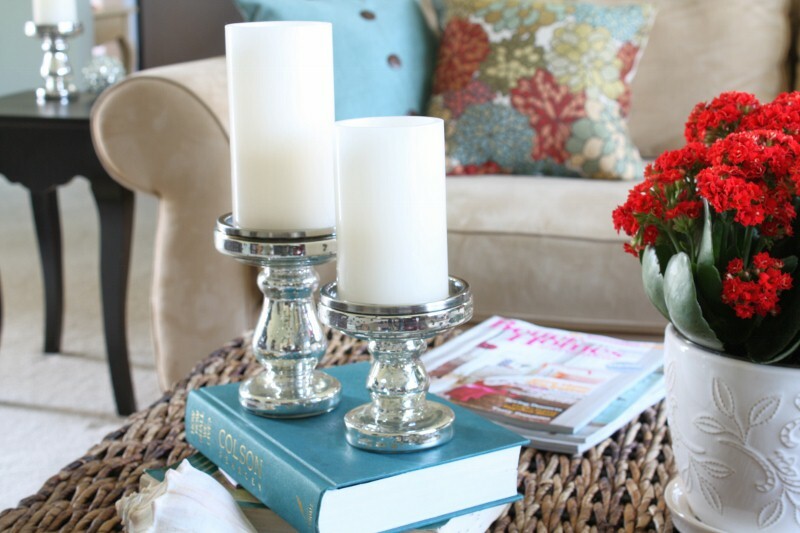 I was shocked at how inexpensive these mercury glass-like candle holders look no different than my high priced designer holders. And pair them with BHG LED lit candles. Go BHG@Wal-Mart! Every southern girl needs a collection of serving trays. 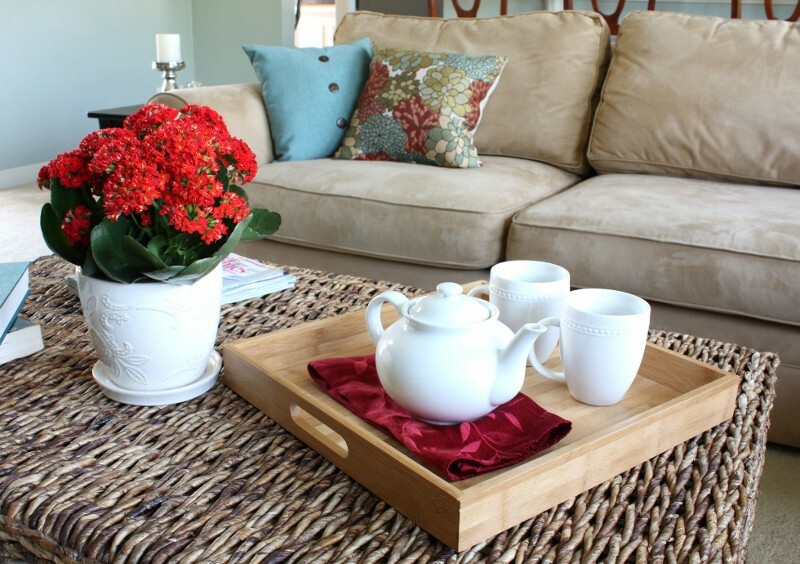 I seriously fell in love with this eco-sustainable bamboo tray by BHG. It is large, light, sturdy and perfect for entertaining indoors or out. The first thing my kids noticed when they came off the bus was the pillows. 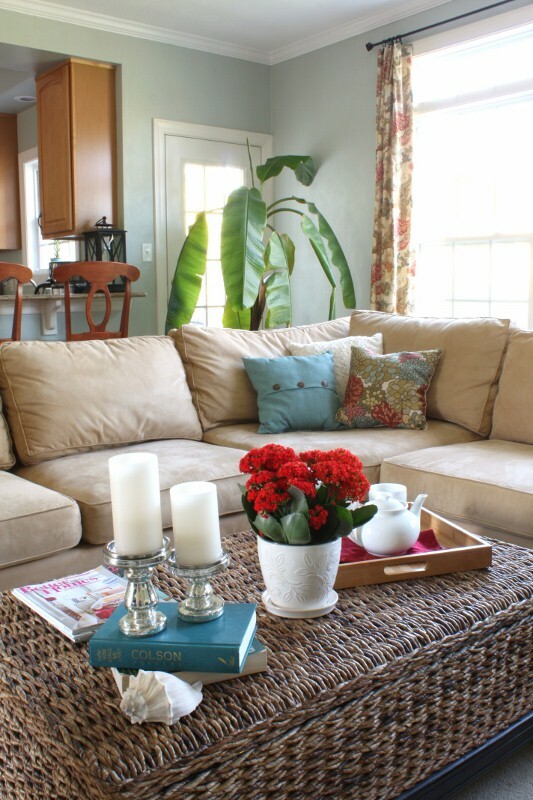 Pillows never last long ON the couch, but easily make their way onto our family room floor, and hope to survive the nightly wrestling episodes. My heart goes out to the beautiful embroidery of the Garden Mumsfield Pillow…. You are strong girlfriend to survive these 4 kids! But the heartthrob is the soft and svelte Ivory Rosette pillow. (They promise to stop snuggling up to you soon….. maybe I need to buy them a bunny???? 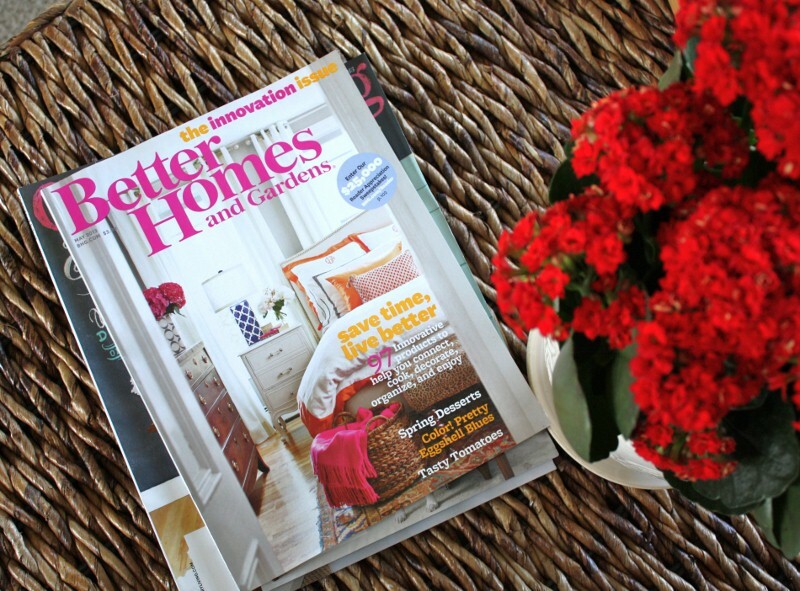 Of course we HAVE to have the latest BHG mag sitting on our coffee table, right? 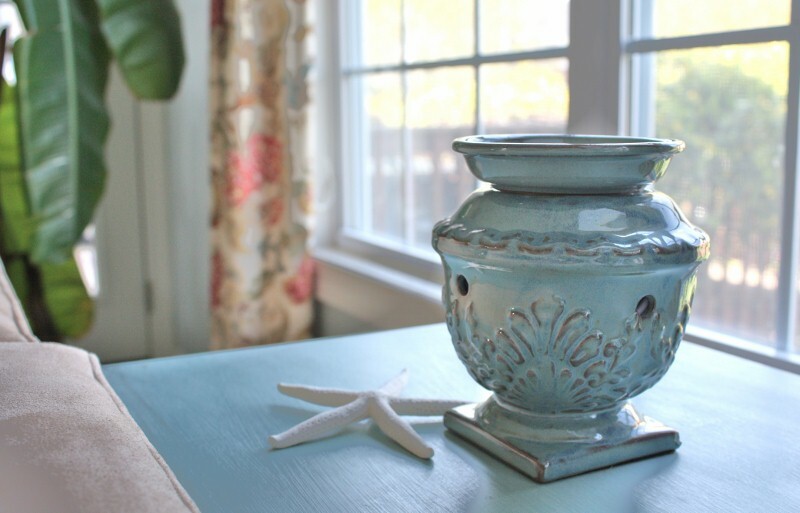 If you aren’t already relaxed enough then let the warm and cozy scent of cookies and vanilla welcome your family home in this beautiful ceramic BHG Scented Wax Warmer. Because my family room is on the north side of my home, it totally lacks in natural sunlight, even though it has a wall of windows. So I have found over the years that the addition of several smaller mirrors will help magnify the light in darker room. 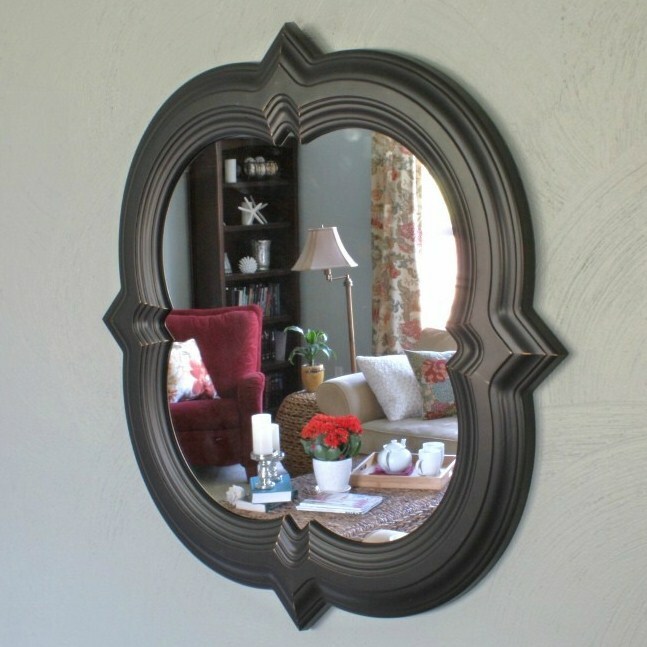 I love this Distressed Black Quatrefoil Wall Mirror. I’m considering grouping several of them together now! They are so inexpensive (under $15)! No matter your budget, Wal-mart has beautiful Better Homes & Gardens home decor that you will love. You could win $1000 for yourself towards a room makeover! Great job! 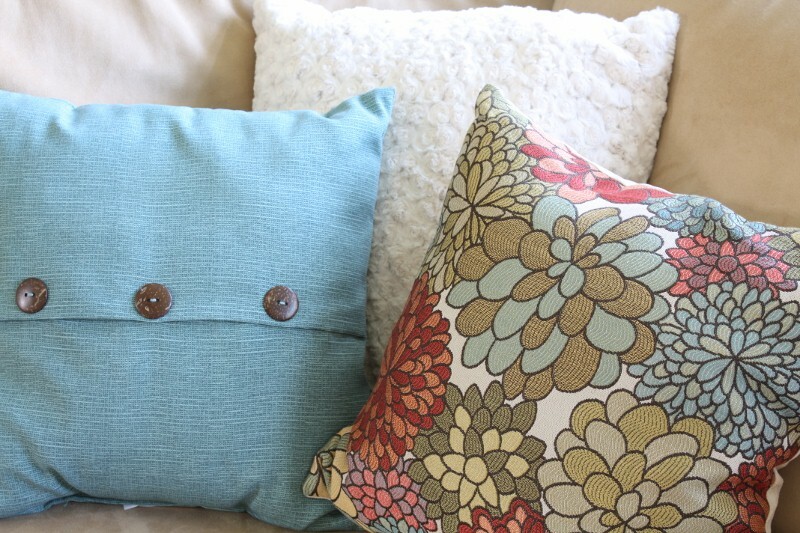 I love the colors … the pillows look beautiful in your fabulous space! 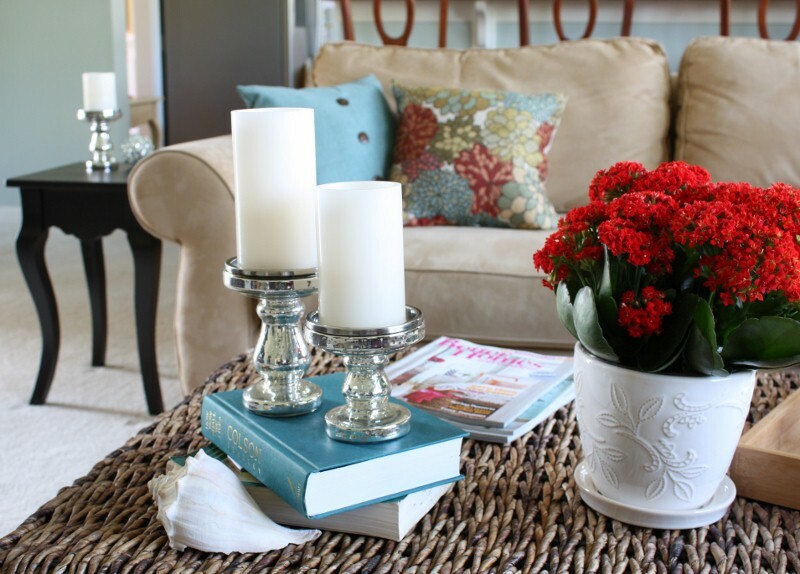 Love the new vignette on your ottoman, too! The BHG products at Wal-Mart is awesome … I’ve scooped up quite a few goodies from their line before! I love the pops of color! And who knew Wal-Mart was carrying such a stylish line? I’m definitely going to borrow some of your ideas when my husband and I start our townhouse makeover this fall! These accessories are so cute! I did this challenge also and I wish I had gotten a few of the accessories you have here! 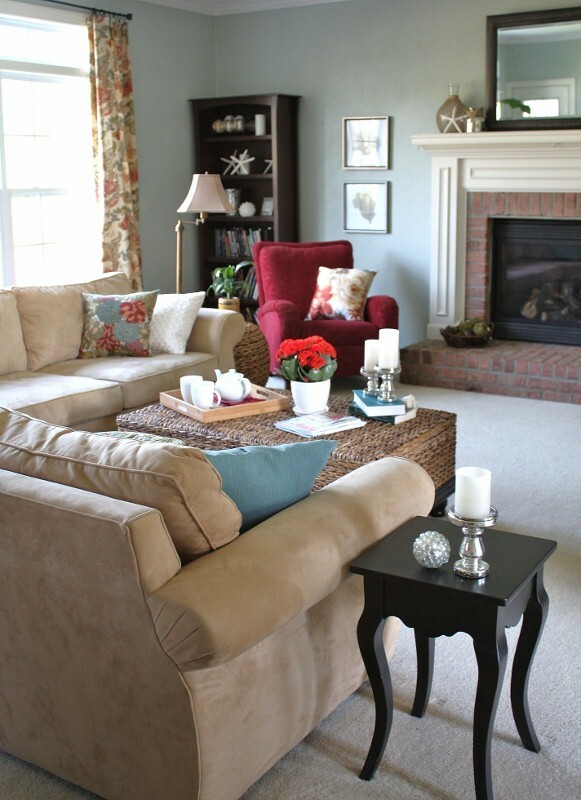 The candle holders, those pillows, the quatrefoil mirror! Great job! Beautiful updates Kim! Love that mirror & what a great price. You did a great job! I love the new colors! BH&G at Walmart does have some nice items! The room looks great! Love the accessories you chose. I’m going to have to check out this BHG line next time I’m at Walmart! 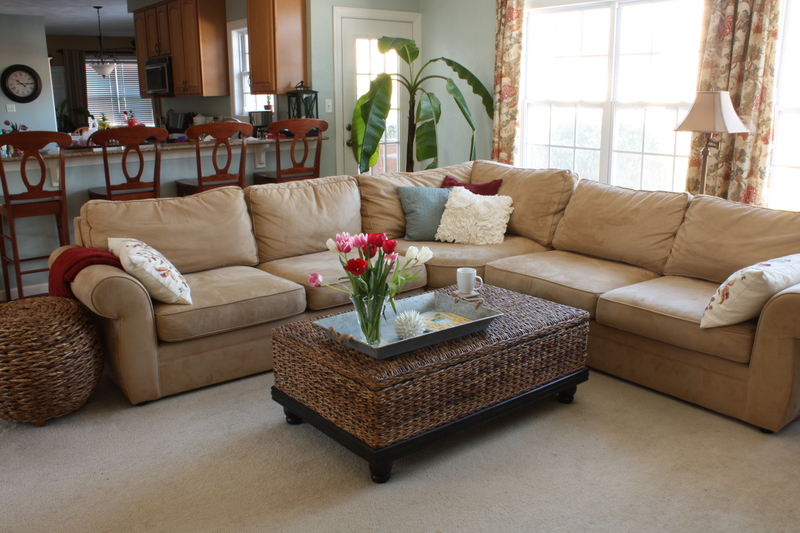 Love the sectional – would appreciate any information you can pass along regarding it! Thanks! Thank you! The sectional is from Pottery Barn. The fabric is their ultra-suede and cleans up so nicely. We love it! I looooove your coffee table!!! Where is it from? Love your curtains. Where did you get them? Love this! Where did you get the blue pillows that match so perfectly and that red chair? What about the chair? Where’s it from? 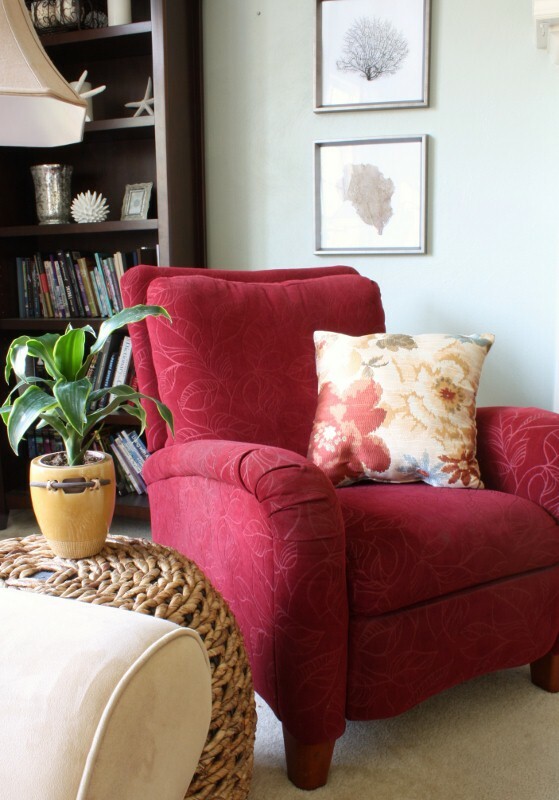 Oh geez, that is ancient, but it is a recliner (and our most comfortable chair) from La-Z-Boy. Thanks! I love it! Looks so comfy and cozy. We are in the process of moving and I am buying all new furniture for the front living room. I want it to be lived in and not something that just looks nice! You definitely captured my vision! Love the colors! Love this room! Using it as inspiration for our new home and family room! Could you add a close up or send me a pic of the curtains? Where did you get them? I am not good at coordinating fabrics, colors, textures, etc…. Thank you! I know this is an older post, but I was wondering if the drapes were still available and if you could tell me what they are called. Hi Michele, They are from Pottery Barn. I can’t remember their name exactly. I’m not sure they still have them but you can check online.